Thermal springs, pre-Incan structures, and some of Ecuador’s friendliest people can be found in the Intag Valley. Tucked into the western slopes of the Andes, 40 miles north of the capital Quito, the Intag Valley possesses that rare kind of climate in which nearly any plant will thrive. Farmers haul in harvests of everything from papayas and passion fruit to carrots and corn. Surrounding their scattered tracts of farmland is a dense jungle of towering palms, broad-leafed ferns and twisting vines. You’ll find more species of orchids than you can count, and a huge variety of bromeliads. This thick cover acts as one of the few remaining intact habitats for elusive pumas, jaguars, and other smaller felines. The endangered spectacled bear also calls the Intag home along with hundreds of varieties of exotic birds. As the condor flies, this cloud forest valley is not far from the market town of Otavalo. In fact, it’s only 35 miles away by road. But for years now that one-and-only road has been a narrow, mountain-hugging dirt track accessible only from the towns of Otavalo or Cotacachi. That’s all about to change. In recent years Ecuador‘s government has placed a high priority on improving the infrastructure of the country. Road improvement projects have been carried out from the Amazon to the Pacific and now they’ve arrived at the Intag. The project is slated for completion at the end of this year. Not only will the upgrade make for a more pleasant ride, but it should cut down on the drive time by an hour or more. This new ease of access will lighten the load for residents when they need to travel to and from larger towns. More importantly, it will also open up the way for expanded tourism and opportunities for adventurous expats. At the moment there are only a handful of expats residing in the valley. Several individuals split their time between hobby farms within the Intag and a home base in Cotacachi. Others reside in the Intag on a full time basis and keep occupied with farming, running small lodges, or conservation efforts. What about real estate? Well, you won’t find many “for sale” signs in the Intag, but ask around and you’ll find plenty of properties for sale. In Cuellaje a knowledgeable local was able to show me several. The first was an approximately 25-acre parcel in the hills above town, priced at $30,000. Bordered by a small stream this land harbors a grove of mature avocado trees, native plants, and a freshwater spring. The views stretch on for miles between the mountains and the rich black soil is perfect for a garden or small farm. Electricity is already installed on the property and cell phone service is available. Several smaller land-only properties border the Rio Magdalena, 20 minutes up the road from Cuellaje, where they are currently used for pastures. Again, the possibilities are broad, farming, rental cabins, or a private getaway are all options here. These lots range in price from $10,000 to $15,000. These are just a few examples of what is available in the Intag Valley, but there is much more out there. The Intag is not suitable for everyone. There are no shopping malls, no clubs or fancy restaurants, and no all-night grocery stores. Houses in the region tend to be on the basic side, meaning that time and effort may be required to add U.S.-style comforts. But for the right person, the Intag can open up a world of possibilities. Thermal springs, pre-Incan structures, and some of Ecuador’s friendliest and most welcoming people can be found here. Maybe you envision a private little organic farm with fresh food year round. 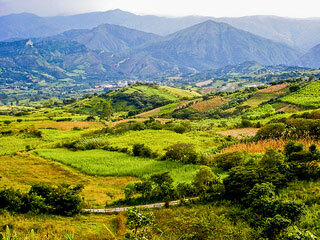 Or perhaps you’re looking to get in early on what could be Ecuador’s next ecotourism base. Whatever your dreams, be sure to check out the well-kept secret that is the Intag Valley.